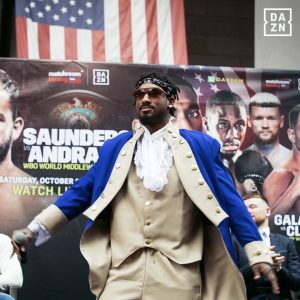 “I want to fight the best,” he adds, “only and often.” Andrade was supposed to face the highly regarded Billy Joe Saunders on Saturday. Unfortunately, Saunders was popped for having a banned substance in his system and was subsequently out of the picture. In stepped Kautondokwa, a largely unknown fighter with a terrific record of 16 knockouts in 17 fights. “When you are fighting lower level opponents,” says Andrade, “you can afford to get in there four or five times a year, but at the level I want to operate at, you can’t do that.” Here is a man who clearly wants to place himself at the top of the mountain. “I’m going to take it one step at a time, do my job against Walter, come home with the belt and we will look to get out early in 2019,” says Andrade. “I know Eddie and DAZN want to keep me active and that’s great, and if it’s going to be the rest of the elite guys, then let’s go.” DAZN, the online streaming service, will be airing the fight live this weekend. In fact, it will be airing the entire card starting at 4:30 PM eastern standard time on Saturday.